Holiday home with swimming pool in Sirtori (Lecco), in Brianza area, just 15 km from Como Lake, known for its beauty and for the beaches equipped for water sports. 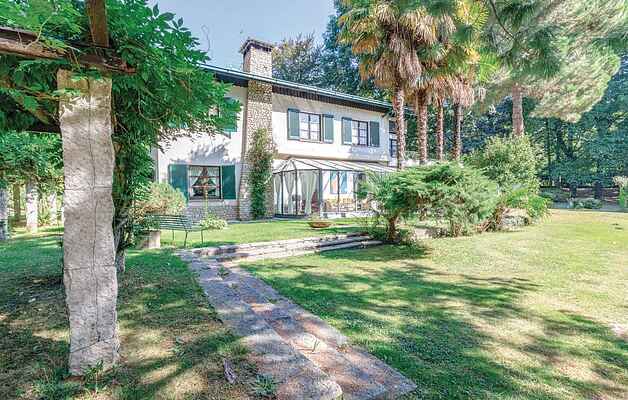 The villa is located in the protected natural area of the Regional Park of Montevecchia. Through a marked route of 11.5 km it is possible to cross the park entirely, from north to south. The villa is surrounded by a large fenced and equipped park for outdoor dining, children's playground with slide, swing and poolside relaxation area. The living room leads to a large veranda with direct access to the garden. Baby bed and high chair available upon request. The bedroom on the 2nd floor has an attic roof and access via a steep staircase. Just 8 km from the thermal baths of Monticello Brianza, 10 km away you can reach the small lake of Annone and the 18-hole golf course. Strategic position to visit the main cities of the area in a radius of 40 km. At 600 m the center of Sirtori (bakery, mini market, restaurant and bar), 2 km shopping center, 16 km Lecco, 18 km Monza, 28 km Como, 33 km Milan and 37 km Bergamo. Ground floor: large entrance with wooden staircase leading to the first floor; on the left the living area. Large living room, with dining area and fireplace and large veranda with direct access to the garden in front of the villa. Kitchen with direct access to the rear garden of the villa (swimming pool, gazebo with table and chairs, barbecue). Library, toilette, play room. 1 ° floor: access to the terrace (40 m2), corridor leading to the bedrooms and bathrooms; on the left side we find: double bedroom, double bedroom with mezzanine with single bed, double bedroom. On the right side: bathroom with Jacuzzi, double bedroom, bathroom with shower, bathroom with tub, bedroom with two single beds. All bathrooms have double sinks. 2nd floor: access through a narrow staircase, attic, double bedroom. The owner lives occasionally on the same property in a small independent house on the other side of the pool and is available for any advice or information.